My astronomer friend tells me that tonight we will see a "blue moon". However, he doesn't mean that the moon will literally appear blue. Blue moon is the name given to an irregularly timed full moon. Most years have twelve full moons which occur approximately monthly, but each calendar year contains those twelve full lunar cycles plus about eleven days to spare. The extra days accumulate, so that every two or three years there is an extra full moon (making 13). The extra moon for that year is called a blue moon. It is where the saying "once in a blue moon" which describes a rare event comes from. Farmers define a blue moon as one that occurs in a season where there are more than three. Others define the second full moon that occurs in a given month as a blue moon. Whether tonight's moon is a blue moon or not depends on whether you use the Farmer's Almanac definition or the "Calendar Blue Moon" definition. The owners of 71 properties in Alicante have now been told that they must demolish the illegal extensions on their properties or face heavy fines. The cases in question include the closing in of attics. patios or terraces after the houses have been passed by municipal technicians. In many instances the extensions had been suggested to the buyers by the promoters. For example, at the Comodoro-Regina Maris II urbanisation, all of the houses have illegal extensions which will have to be demolished. Any extension which increases the size of a house beyond that for which it was licensed could be considered illegal. The only extensions that are legal are those which are temporary e.g. a gazebo or are constructed using removable materials. The little bit of a headache this morning tells me that we enjoyed another night up at the Pedrera . There was a good mix of English and Spanish people of all ages (even babies in prams) up there ready to listen to Freeway in the outside entertainment area. During their first set, the band couldn't quite work out why there was so much echo on the music which was making it difficult to listen to. They finally figured the fault was the wooden roof that José has had installed above the stage. Moving their speakers onto the dance floor made a huge improvement. Freeway then played a wide repertoire of music including a number of R&B classics whist José , who outdoes me for a love of gadgets, kept adjusting the lighting with his remote control. The five euro entrance fee included a free drink at the bar rather than food. For those who were peckish though , there was a BBQ serving ribs and chips which we understand were delicious. Finally we had the GRAND DRAW. The first number out of the bag was 6 which gave 20 people (including me) a chance to win the 250€. The second number narrowed that down to just two. For the second week running, the final number meant that nobody had won. So another rollover taking the prize to 300€. I reckon with only 120 people playing and 1,000 numbers to choose from the prize could rollover several times and maybe even get to 500€ or more. A message to José - When I win I'd prefer the money in low denomination notes that can easily be used rather than those 50€ ones that shops hate. PS Remember Wednesday night is QUIZ NIGHT. Telmicro are promising customers that they will be back on air by the end of September. Whether that is true and quite what they will be broadcasting remains to be seen. If their package consists solely of freeview programmes then it will be hard for them to justify charging a monthly subscription. In any case the situation is more complicated than Telmicro are suggesting. It seems that no company based in Spain has a licence to show the BBCs public service channels. Companies that do this are breaking copyright laws. European law allows channels that are broadcast in an EEA (European Economic Area) country to be licensed for cable redistribution in another EEA country. The only countries that currently have licences for cable redistribution of BBC programmes are the Republic of Ireland, Belgium and the Netherlands. That is not to say that a Spanish company couldn't apply for a license but it would be up to the BBC to decide whether to grant it. I'd guess the application process would take longer than a month to complete. BBC World News is freely distributed in Spain e.g. as part of the Digital+ package. BBC Prime, on the other hand, is licensed to individuals who buy a subscription to the channels and receive a smart card for their satellite box. However, BBC Prime doesn't provide live coverage or highlights of sporting events so would not satisfy those who are missing Sky sports coverage. Re-broadcasting Sky is obviously illegal and in breach of copyright. In fact BskyB makes it clear that it is illegal to receive its programmes in Spain by any means. Reception of their programmes is only authorised in the UK and Ireland. Those who pay for a Sky viewing card via a UK address are therefore breaking the law and risk having their cards deactivated. Companies that offer Sky cards here in Spain often register up to 3,000 subscribers to one UK address. Sky have got wise to this and will cut off cards where there are more than five registered to one address. If you are only viewing the freeview channels via your Sky box i.e. without a viewing card then you stand a better chance of keeping your reception. You can get the free-to-view programmes via a satellite dish and a freeview box but most of them will be in Spanish (or German) with the odd programme which can be switched over to English. You position your sunbed so it is nicely in the shade, lie down ready for a pleasant afternoon nap and just as you are about to nod off a fly comes to land on your face. You waft it away only to find the cheeky bugger returning time and again to irritate you some more. Any chance of sleep is gone as you struggle to rid yourself of the nuisance. Even with a fly swatter or a rolled up newspaper to hand, my success rate at swatting flies is abysmal. I hover over the fly and then just as I pounce - the fly escapes. Scientists from the California Institute of Technology have now explained why my technique doesn't work. Instead of just taking off when they see an object hurtling towards them, flies carefully plan an escape in milliseconds. A fraction of a second before a fly springs into the air, it will alter its body position so that it is properly prepared to jump in the right direction. If the blow looks as if it is coming from behind, the fly will move its middle legs forward a little and lean back, so it is ideally positioned to jump forwards into the air and away from the threat. For a threat from the front, it will move its legs backward and leap that way. For sideways threats, it will keep its legs still and lean to the other side to get ready for a lateral escape. The entire process of calculating the direction of the threat and preparing the body takes just one tenth of a second, and it will have flown away within two tenths of a second. The right approach is therefore to aim not at the insects themselves because they are extraordinarily good at anticipating where exactly your blow will land. It is best to aim a bit forward of the fly's starting position, to anticipate where it is going to jump when it first sees your swatter. Here are three further suggestions that might help me achieve a higher success rate. This method never fails: hold the swatter handle with one hand then, with your other hand, pull the neck back away from the fly and release. The spring action is too quick for the fly and you are guaranteed an accurate swat. I have realised after successfully swatting thousands of flies why the fly swatter is better than using a rolled up newspaper.It is because a fly can still see through a flyswatter's mesh/lattice work and does not rate it as serious a threat as a rolled up newspaper which cuts out the light. Never try to hit the fly directly where it sits. Simply clap hands together about 5 cm above where the fly positioned. It flies into the path of the hands as it can only judge the threat from one direction. Always works for me. Oh yes, have soap to hand for washing afterwards! That was the technique my father used when he came to visit us. It was obviously successful for him because he was surrounded by dead flies at the end of each day. The 63rd "war of tomatoes" took place on Wednesday. Six lorries brought 113 tons of tomatoes for the 40,000 crowd to throw, to roll in and generally get messy with. I can't see many women in that picture! For those of you who watch British TV via Telmicro. A spokesman from Telmicro manning the information help line which has been set up in wake of the problem, said equipment was still being held by investigators and, due to the slow pace of August, it was likely that Telmicro would not be able to switch customers back on until September – and, realistically, nearer the end of the month rather than the beginning. An official statement released by Telmicro Levante says they have all the relevant licenses and legal permits in order to broadcast and operate. The closing of the broadcast has nothing to do with Telmicro Levante being prohibited to broadcast, however all the relevant technical material is being looked at and Telmicro promises all its clients to restart broadcast and business as soon as possible. Since all the Court proceedings have been declared secret, Telmico is not allowed to provide any detailed information. Furthermore, it is against the law for anyone to communicate any information regarding the ongoing investigation. Telmicro also want to reassure customers that they will not be charged and no bills will be sent during this time and until further notice. We assumed that it was part of the Mediterranean psychic that drove young men to go into a ring and fight bulls. A sort of death wish that they also exhibit on the roads and in their handling of fireworks. We reasoned that with age and experience they would grow out of it. Either that or bad experiences in the corrida would make them realise it wasn't the safest way to earn a living. Most toreros retire at a reasonably early age but not this man. The remarkable thing is that not only is he the oldest person in the ring but he is also British. Three years ago, 62 year old Frank Evans, a grandfather from Salford, was forced to retire from bullfighting on his doctor's orders. Fellow matadors cut his ponytail and carried him on their shoulders from the Benalmadena bullring on the Costa del Sol showing him the same respect they would any full-blooded Spanish torero. Now aged 65, Frank will will don his cape again and step into the ring in southern Spain on Sunday following a quadruple heart bypass operation and knee replacement surgery completed only a few months ago. The son of a Manchester butcher, Frank ran off to Spain to enroll at a bullfighting school in the 1960s after reading a book about it. At first he was dismissed as being "too English" and at 23 "too old" to begin to learn the art. However, he went on to dispatch more than 300 bulls in his forty year long career in the ring. Since killing his first bull in 1966, "El Ingles", as he came to be known, has stunned aficionados unaccustomed to seeing a Briton in the ring. Frank already has a foot long welt on the inner thigh of his right leg from a goring in Mexico. His lower left leg is scarred from a fight in Spain and his backside was torn apart by the horn of a 15-year-old cow on a training ranch in 1983. But he promises to show no fear when he faces a 350kg bull at Villaneuva de la Concepcion on Sunday. We've got cocaine coming in from the north of the country and hashish from the south. The Dirección General de la Policía and the Guardia Civil found a yacht trying to unload 2.5 tons of of the stuff in 81 bundles along with three packets of hashish pollen at the sports port at La Marina. Eight people were arrested - three from the boat and five who were helping unload the stuff . The police also found two 9mm firearms, 14 mobile phones, a satellite terminal, a GPS navigator, a laptop and 3,720€ in cash on board the boat. The drugs had apparently been transferred to the yacht from a Moroccan boat out at sea. You do wonder how these people thought they could unload 81 packages from a sports boat without being noticed. The boat arrived at dawn when they'd hope few people would be about. Even that would make them look suspicious especially when five people were hanging around waiting to greet the arrival. Those of you who live here in Bigastro and are partial to HP sauce, Branston pickle, Weetabix, Colman's mustard and the like should pay a call to the new Hiperber supermarket. They have a whole section of what they call "International food" which carries all sorts of things that are missing from most Spanish supermarkets. The shop also has a good delicatessen counter with a wide range of meats and cheeses to tempt you and an impressive selection of bottled and canned beers. In fact, all told, it is a good place to shop. Hiperber is situated between Calle La Paz and the dual carriageway Calle General Bañuls (opposite the Star Sol offices) with its entrance on Calle La Paz. There is underground parking for customers at the far end of the store. Much of the UK experienced rain or unseasonable temperatures instead of blazing sunshine over the Bank Holiday. Even with millions off work, beaches were virtually empty as the temperature failed to rise above 20°C. So no change there. Can anyone remember a decent August Bank Holiday in Britain? The good news however, is that forecasts show that temperatures could soar to as high as 27°C by the weekend. This August was one of the wettest on record, with parts of Britain affected by flooding. In the early part of the month they had double the average amount of rain for this time of year. It's no better for those Brits who have jetted off to the Dominican Republic to find a bit of sunshine. The US National Hurricane Centre warned last night that Tropical Storm Gustav had formed in the central Caribbean, and was rumbling toward the island. It is expected to bring 60mph winds and heavy rain to the islands. Thousands of kilos of cocaine have arrived this summer in Spain but not all of it is coming in via the southern coast. Since the beginning of August, in only three weeks, the police and the Civil Guard have seized more than eight tons of this substance. Most has been seized in Galicia. The rest has been found in Barcelona and Valencia, where only yesterday the police seized 318 kilos which was hidden in 292 planks of wood. The Galician route, which was the main entrance from cocaine to Spain, seemed to have become dormant. For several years now the seizures have been small in comparison with those in the nineties. The police knew that the Colombian narcotics traffickers had changed their tactics and were concentrating in western Africa; a place where it is easier to land the drugs without detection. However, in Africa drugs bring very little revenue, so it is necessary to import them in Europe which is more difficult. This is the reason that they are back to landing the drugs in Galicia. Narcotics traffickers always try to use routes they consider safe which why they have returned to using the Galician route more extensively - they thought that monitoring there had ceased. The truth is it never actually stopped; last year more than a thousand kilos were seized in less than two weeks during July and a fishing boat was found with 2,500 kilos at the end of July. In a combined-arms operation with the United States DEA, 1,400 kilos were seized in Barcelona. And last week, "el Mulo", another historical route for drug trafficking in Galicia, was stopped in an operation that included four tons of cocaine. On this occasion the traffickers were surprised by a Customs' helicopter . So the fight goes on. Whilst there is a huge market for cocaine in Europe, the drugs barons of Columbia will continue to find ways to ship the stuff via countries like Spain. The police try to be one step ahead. Although they can't stop the trafficking, at least they can slow it down. When we first got our ADSL via Telefónica it was wonderful to have a 3Mb connection. The previous setup with Clear Communications offered 1Mb on a good day with a following wind. In England I had 512Kb ADSL. At that speed, a large update for Windows could take 40 minutes or more to download. If you tried to open another connection it would take forever! With 3Mb available those days were behind me. Telefónica have been upgrading their equipment and started to offer 10MB connections. I checked to see I could receive such speeds but they told me the maximum speed for my line was still 3MB. Now though, according to Telefónica, my line will support speeds up to 10MB WOW! I possibly don't need a connection that fast but what the hell - I have to have it. Watching videos online will be unbelievable - no stutter -no poor quality - just high definition perfection. .....and the cost, an extra 4€ per month. Those of you who have studied Spanish will know the frustration when you try to use your new language skills. Locals look at you as if you are speaking Martian. To make matter worse, in Bigastro they use words that don't exist in our text books. Hi there, my name is Peter Christian and in the next few minutes, I'll show you how you can easily make your spoken Spanish burst into life by speaking the rich, vibrant streetwise Spanish you won't find in formal language courses. You'll speak the genuine day-to-day Spanish spoken throughout the Hispanic world most Spanish language students never know - and the locals will just love you for it! Vibrant, Authentic Spoken Spanish Time and Time Again! OK, I'm sure like me, you know what it's like. You invest so much time and effort into studying Spanish but when you visit an Hispanic country and chat with the locals it's as if they're speaking double Dutch! And when you do speak, they smile politely and respectfully but let's be honest, they're hardly bowled over! And then there's those embarrassing howlers causing hoots of derision or even unintentional, awkward offence and possibly earn you a humiliating rebuke. All of these happen regularly mainly because formal language study doesn't teach you the day-to-day language leaving you in the dark about those little things that can mean so much in Hispanic culture. Little things but they make a HUGE difference. Like you I know all too well how this feels - I live in Barcelona and I soon found out that much of the Spanish the locals were speaking simply wasn't being taught in any of my three courses! It really is so frustrating isn't it? So much so you lose all of your enthusiasm and end up speaking basic enough-to-get-by Spanish and even then, only when you absolutely have to. All this does is to greatly irritate and annoy the very people who you want to impress and who you really need on your side - the locals! They have very little patience - and even less respect - for visitors who don't speak their language and you know what? They're right to be so dismissive and abrupt with such people - it's their culture after all! Following a pleasant evening with friends, you are ready to go home to bed, so you say, "Voy a mi casa a planchar la oreja" literally I'm going home to iron the ear! And if you've overslept, you can can say "Se me pegaron las sabanas" which means The sheets stuck to me! I love those examples and I know exactly what you mean Peter. Where you lost it for me was when you claimed that I could be streetwise in a week. It took me 34 years to be streetwise in Scouse - so I'm dammed sure it will take me a lot longer than a week to be streetwise in Spanish. Following our meeting on the 5th, last night there was a disco up at the Albergue. The music was good (not too loud! ), the atmosphere was right and people were enjoying a night away from their blank screens (sic). Of course the big attraction was the GRAND DRAW with a prize of 200€ donated by José. All residents can have a free entry to the draw and choose any number between 000 and 999 which has not already been taken. To win though you have to be there on the night the draw takes place and have the lucky number. First off; members cards were drawn for prizes of a bottle of wine, 10€ and 20€ of drinks at the bar. Then came the main prize. The numbers were in the bag. First one out meant that 13 people were in with a chance. The second number narrowed it down to 4. The question was; would the third number bring luck to one of those four and more important. would the winner be there to collect the prize. Much to our relief because we weren't one of the four, nobody had the winning number. So the draw will roll over to next Saturday the 30th when the prize will be increased to 250€. As if that isn't enough to tempt people out; José has booked Freeway, a R&B, Rock n Roll, and Country Rock band to play in the outside bar area that night. Tickets are just 5€ which includes the first drink free. It's time to get out the lucky pants, the four leaf clover and seek out any black cats. PS For those who can't wait until Saturday to chance their luck, there will be a RACE NIGHT on Wednesday the 27th. No entrance fee for this - just take some loose change for a flutter. About 40% of Bigastro was blacked out for three and a quarter hours on Friday when a truck, with its crane unfolded, managed to cut a medium tension cable which supplies the town and nearby Jacarilla. The problem occurred at 2:45pm. It then took until 6pm for Iberdrola to complete a provisional repair, returning yesterday morning to finish the job. Although, emergency calls to the Health Centre were suspended for the period, other services continued thanks to the backup generator. Commercial premises, without such facilities were disrupted and bars which normally open at 5pm couldn't open fully until 6pm. So that might explain the couple of power cuts we had on Friday but why have we had three already this morning? The insect that makes all the noise in the garden is what the Spanish call chicharra - we would call it a cicada. Cicadas like heat and do their most spirited singing during the hotter hours of a summer day. In fact it seems the hotter it gets, the louder they become. Only males produce the cicadas' distinctive sound which can be as loud as 120 dB at close range - among the loudest of all insect-produced sounds. It can be difficult to determine which direction the cicada song is coming from, because the low pitch carries well. They also seem to sense your approach and stop "singing" when you get close making it difficult to locate them. One thing for sure, you can't have a nap outside when one is in full song. Those Telmicro bosses and employees who were arrested last week in a major police swoop on the company have now been released. In all, 17 people, mostly British, were arrested in the police operation. The investigation has been ongoing for four months. Telmicro appeared to operate legally and indeed argue they, unlike others, they have their Spanish licenses which allow them to broadcast. However, it seems that Telmicro is being accused of infringing intellectual property rights. Re-broadcasting a signal without the official authorisation is classified as fraud, especially if the signal is being sold. Charging for free-to-view channels is one thing, charging for re-broadcast subscription channels is something else. Interestingly the other companies, which are still operating have removed all Sky subscription programmes from their lists. When the shut down occurred apparently many were in tears, others were ready to pack their bags and fly back home at the prospect of a life without their British channels. I have to say I find that hard to believe. Life without a regular supply of water or electricity, which is what some face, is intolerable but life without British TV! Following joint action between the local police and the Guardia Civil, three men have been arrested on charges of domestic violence. The first was an Algerian who had been denounced by his wife. The other two were Spaniards; one who had a previous record of violence was denounced by his mother and the second was denounced by his partner. He'd already been served a restraining order which he ignored. Thankfully the incidence of serious crime in Bigastro is very low and such cases are rare. Still it is comforting to know that when they do occur swift action is taken. When we first moved in, we had the house and garden to ourselves. Gradually, over time, all manner of birds, insects and cats have found their way here. The large ones process in orderly lines marching to and fro from their nests. The medium size ones are not quite so organised but still live in the garden. The tiny ones, not content to just live in the garden, invade the house as well. Actually, the large ones are interesting to watch. Drop a crisp on the paving and they will appear as if by magic. Once they've located their target, they work together to return the booty to their nest. Some will pull from the front whilst others push from behind. They'll even climb on each other to get a higher purchase. It might take an hour or so but they get there in the end. The tiny ones are the real nuisance. We first found them in the en-suite bathroom (the one Pam uses) where they favoured the basin. With judicious spraying, I managed to eliminate them from there. Next they would appear in the kitchen whenever crumbs of food were left out. We got wise to that and made sure that everywhere was cleaned up. Not to be fooled, the little b****** found their way into the sugar jar. The lid has a rubber seal but that was obviously no match for their ingenuity. Now they have started to appear in the main bathroom (the one I use). Well they can think again. I don't want to adopt ants as pets thank you. Just found your blog. Will be back to read more later. No more quakes today? Welcome Jo to our blog. We average about 70 visitors a day, mostly from Spain and England but with the odd one or two from further afield. What the two visitors from Slovakia or Serbia make of it we'll probably never know. In answer to your question - there have been no more earthquakes in this area since Monday. Hopefully it will be a good while before we are woken up by another one. The people of Almoradí congregated in La Plaza de la Constitución yesterday to ask San Emigdio, the saint who protects against earthquakes, to help them. The parish of San Andrés organised a "rogativa", preceded by mass. A thousand people gathered to ask San Emigdio to stop the tremors after the series of seisms in the region. They are especially concerned following the one of 3.4 on the Ritcher scale and a second of 2.7 both with their epicentres in Algorfa. As part of the rogativa, San Emigdio was carried around the town by members of the Civil Defence and even by the Mayor and other Councillors for a brief period. The town has not experienced a series of tremors like the ones we've had over the last two weeks for 61 years. People are naturally scared. Organising a public oration to ask for help is a tradition which they hope will prevent further tremors from occurring. In 1829 an earthquake destroyed part of Torrevieja and other towns in the area. In total 389 died, 375 were wounded and 534 houses were destroyed in Torrevieja. They experienced 57 tremors during one single day. Almoradí, Guardamar and Torrevieja were all affected. Since then, Almoradí has put its trust in San Emigdio to stop earthquakes by organising traditional rogativas in the month of March. Now, given the circumstances, they have organised a second rogativa for this year. A few of you have spotted the link in the sidebar and visited the site which I created for our friends Chris and Linda. Chris and Linda have a house at Lomas de Cabo Roig which they are prepared to rent out to discerning guests. It's well worth considering if you have friends looking for somewhere to stay or if you know someone seeking high quality holiday accommodation in this area. The property is close enough to the beach and other amenities but at the same time situated in a quiet neighbourhood with easy parking and a communal pool next door. For those how have missed it, the link is here. The scale of British water consumption and its impact around the world is revealed in a new report today by the WWF, which warns of the hidden levels needed to produce food and clothing. The UK has become the sixth largest net importer of water in the world, with every consumer indirectly responsible for the use of thousands of litres a day. Only 38% of the UK's total water use comes from its own resources; the rest depends on the water systems of other countries, some of which are already facing serious shortages. With modern patterns of consumption, businesses and consumers are inadvertently contributing to the slow death of some of the world's most important rivers, the charity warns, and we may not be able to depend on the same supplies in the near future. British retailers are already examining how much of their food comes from areas where water reserves are depleted and whether they will need to relocate some of their production as water runs out. The WWF report identifies Spain, northern African countries including Egypt and Morocco, South Africa, Israel, Pakistan and Uzbekistan as countries which face acute water stress and yet supply the UK with substantial exports of their water. But over-extraction of water for horticulture and the tourist industry have led to a crisis here. Aquifers have become severely depleted and the water table has been infiltrated by the sea. There are massive challenges with water in places like Murcia. We have to look at least 10 years ahead in terms of security of supply. Murcia will have to look very different in five years' time. As most will know by now, Guardia Civil raided the offices of television re-broadcaster Telmicro Levante SL. in Algorfa and San Luis, Torrevieja. In Algorfa the whole industrial estate was cordoned off and anyone who had dealings with the company were taken away for questioning. Equipment and computers from both offices were impounded and the premises sealed off. Officers of he Guardia Civil were posted outside to prevent anyone from entering the premises. Nobody is saying why the action took place because the operation is being kept secret. Meanwhile rumours abound. Problems with the Telmicro Levante SL service first occured in May when the signal for Sky programmes was lost. At the time the company stated, via their TV channel, that they had been ‘forced to undertake the transition to new English language channels’. When Sky Sports channels reappeared in June a further message appeared which seemed to suggest the re-broadcasting of Sky could be the source of the problem. Telmicro concluded that there were several channels that were being transmitted free to air by different companies. Amongst them were Sky Sports 1, 2 and 3 which we all know cannot be transmitted. BSkyB clearly state that they only authorise the reception of Sky TV in the UK and Ireland. Their terms and conditions expressly prohibit reception elsewhere in Europe. The third annual British Behaviour Abroad report reveals that UK nationals are continuing to get into trouble overseas – with increasing numbers of them in Spain. According to the report, around 17 million Brits visited Spain during the period -April 2006-March 2007 . There are also an estimated 761,000 UK residents living in the country. Of these 5,470 people required ‘serious assistance’ from Consulate offices following arrests, hospitalisations, deaths or reported rapes – double the number of any other country. In comparison 14.8 million Brits visited France where an estimated 200,000 UK residents live. During the period covered by the report there were just 1,572 serious assistance cases in France. In the breakdown of figures Spain had the most arrests with 2,032 – a total of 33% more than last year – although proportionally Brits were more likely to be arrested in Cyprus, closely followed by the USA and the United Arab Emirates (UAE). Not surprisingly the majority of problems were related to excessive drinking. The advice is to know your limit and try not to drink more than you usually would at home. Following reports about binge drinking in the British press, I'd say they'd be better drinking a lot less than they do at home. The regularity of earthquakes this year is causing alarm amongst some of the population here in the Vega Baja. A senior technician from the Seismological Centre of the University of Alicante believes that the latest tremor was an echo of the one we felt on the 5th, pointing out that the wave pattern was very similar. He reassures us that tremors where energy is released little by little is the normal pattern and therefore nothing to be alarmed about. We cannot discount the possibility of further tremors in the following months. In fact in the last ten days alone there have been over forty tremors on the Iberian peninsula, the strongest being 3.1. The south of Spain and the area bordering France are both earthquake zones. We're getting so used to earthquakes now that we hardly notice them. The one this morning, at 2 minutes past 5, was again near Algorfa and registered 2.7 on the Richter scale. Pam just said "earthquake" and went back to sleep. When we were walking back to the car on Saturday night we noticed that the moon looked strange as though it was partly covered - of course it was. What we were observing was a partial eclipse. Although it is not clearly documented, San Joaquín (or Joachim as he is known in other countries) was reputed to be the husband of Saint Anne, father of Mary and therefore grandfather of Jesus. Joaquín was described as a rich and pious man who regularly gave to the poor and to the temple at Sepphoris. However, because he and his wife had no children, the high priest rejected Joaquín and his sacrifice. His wife's childlessness was interpreted as a sign of divine displeasure. Joaquín consequently withdrew to the desert where he fasted and did penance for forty days. Angels then appeared to both Joaquín and Anne to promise them a child. He returned to Jerusalem where he embraced Anne at the city gates. The sculpture of San Joaquín by the Murcian artist Francisco Salzillo, dates from the 17th century. You can normally find it in the right hand chapel of the Iglesia Nuestra Señora de Belén here in the main town square. The tourist sector on the Costa Blanca has its sights set on the Russian market to boost flagging levels of income. Occupancy has fallen 5% and income 15% following the crisis that has hit Spain. Sixty thousand fewer Spanish tourist in the first seven months of the year have hit the tourist trade hard. The 20% devaluation of the pound against the euro hasn't helped either. Two million Russians visit the Mediterranean each year but they currently favour Turkey followed by Egypt. Coatia and Italy. Those that visit Spain choose Catalonia. Fifteen years ago, Catalonia opened a tourist information office in Moscow which has obviously paid off. Now the tourist industry on the Costa Blanca want the Consell to do the same for them. They also want to target Italian tourists. The Italians like fashionable resorts and currently favour Ibiza, Formentera, Croatia, Tunisia and the Caribbean. The industry wants them to find places like Benidorm equally chic. The tourist industry is asking the Consell to advertise the theme parks in the area (Terra Mítica, Aqualandia and Terra Natura) more widely. These are major attractions that need promoting. Of course, Valencia will benefit from the F1 race next weekend which it is estimated will bring in 70,000,000€ from the 140,000 visitors. Other sporting events like the Vuelta al Mundo de Vela and the Masters de Golf Costa Azahar de Castellón will inject much needed cash to the area in the same way that the America's Cup did in 2007. Each year the Annual Fiesta seems to get better and better. Perhaps it is because we understand more of the traditions that surround the festivities or maybe because we know more of the people involved. Whatever the reasons, we have thoroughly enjoyed being part of this year's event. We would like to thank the Presidente, Manuel José Robles Sanchez; the Comisión de Fiestas; the Concejalía de Fiestas Ayuntamiento de Bigastro and all those who contributed for making this year's Fiesta so special for us. We hope our photographs serve as a lasting memory for those who were here and an inspiration for those who weren't. After a week of late nights, of partying and fun; it was time to pay one last tribute to the patron Saint of the town. In time honoured tradition, San Joaquín was taken around the town accompanied by the fiesta queens, town dignitaries and countless well wishers carrying candles in his honour. Back at the church, San Joaquín was treated to a spectacular firework display before being safely placed inside until next year. There are plenty more pictures for you to see in my album. Just click on the link to the left under Our Web Sites. At about 1am on the 16th, the townsfolk and neighbours process along the calles to welcome in the day of San Joaquín. As they walk, they clap to the rhythm provided by a band. Once the procession arrives at the church, a firework display signals the start of this most important day. Whilst the Floral Parade is the most beautiful, the Main Parade is possibly the most popular. All the camparsas make a supreme effort to provide us with an exciting display. 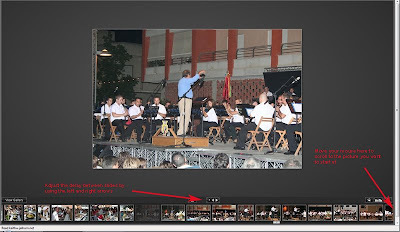 I have been asked a couple of questions about the FotoPlayer applications I've used for my photos of the Fiesta. Do I have to go through all the pictures each time I go to your album? Can I alter the delay between slides? In answer to 1. you can scroll to the picture you want to start viewing from by scrolling through the thumbnails at the bottom of the screen. Click on the one you want and the show will start there. and 2. You can shorten or lengthen the delay by using the left and right arrows on the screen when Foto Player is running (by default the delay is 7 seconds). You may be wondering why there are no pictures from the parade of camparsas on Wednesday night. That is the one where people in the flats along the calles throw buckets of water over them Some even turn hoses onto the passing comparistas. In this hot weather the soaking they get may well be appreciated. Well this is a blog read by people of all ages and I wouldn't want to offend people by publishing provocative pictures of young ladies in wet T-shirts. Actually that is a load of b*******. The truth is we didn't go down to watch that parade! You'll notice also that there are no pictures of Natalia - I'm afraid you'd have to have been there to enjoy that pleasure! No Fiesta would be complete without a concert by Sociedad Unión Musical de Bigastro. Last night's programme contained several pieces by General Francisco Grau Vegara, Director of the Banda de Musica de la Guardia Real since 1998 and the first musical general in the Spanish army. He is of course a bigastrense. General Grau took the baton for the first piece which was one of his own compositions - a pasadoble. Susi Gálvez brought tears to the eye with her solo singing. Manuel Gutiérrez Lopez, directed one of the best performances we have heard from the band. Following the band concert in the town square; there was an altogether different performance in the park. The very foxy Natalia delighted an audience both young and old - especially the men. She was HOT! Probably the most beautiful of the Fiesta parades is the one where children and adults offer flowers to San Joaquín. As you can see many dress in traditional costume for the event. Have you noticed the change in the weather today? The sun has disappeared and there is a heavy covering of cloud. You know the weather always changes when Mary Poppins is about to appear. Susana and her camparsa have the theme of Mary Poppins on Friday for the fancy dress parade. So it could be them that we need to blame! The Treasury is moving to embargo the bank accounts of EU citizens who are not residents in Spain. Effectively this will mean that they won't be able to withdraw funds nor will any standing orders be paid from their accounts. This is only affecting foreigners who opened accounts with either passports instead of NIE numbers or with NIE numbers without paperwork from the National Police declaring that they are not residents in Spain. Since we don't subscribe to any UK TV system, I can't say for sure but I'm told that at least one of the microwave services has been disconnected entirely. People who signed up for it now get a message on the screen which says no signal. Timing is everything and for this to happen in the middle of the Olympic Games must be very frustrating for many. I know some were hoping that Rupert Murdoch would set up some sort of deal with the local microwave TV providers here on the Costa Blanca. That now seems highly unlikely. The problem wasn't just with Sky, the system of re-broadcasting was illegal under Spanish law. So for those of you desperate to watch UK television, the options are now more limited. Freesat was launched this Spring and offers TV, digital radio, interactive, and even high definition ( HD TV ). Originally broadcasting 80 channels, it is set to increase to 200. To receive this service in Spain you need a small satellite dish, a Spanish freeview digibox and installation. After the initial costs there are no monthly charges to pay. The downside is that you won't get the Sky programs that you may have been offered with the microwave system. So no Sky sports. In Spain there is a bar or restaurant for every 456 inhabitants according to the Economic Yearbook of Spain 2008 produced by la Caixa bank. In Aragon, Asturias and the Balearics the ratio drops to an average of 350 people to each bar and in the Valencian Comunitat there is one for every435. Of course some of these places are so small they can only cater for a dozen or so people. Still it does mean that you can truly call the bar you favour your local. Just don't try to get in when the other 434 are there! This is fast becoming one of the most popular events at the Fiesta. The laden tables were soon cleared by an enthusiastic clientèle. The British contribution was very well received. As one lady said of the desserts and cakes she tried, "buenisimo" - a true compliment indeed. PS One of our neighbours, who has been nursing a head cold for two weeks, still managed to make a couple of dozen Chelsea buns which her husband brought down. I understand, from those who tried them, that they were delicious. The new "A Tapear" event has proved to be very popular. For 1.50€ you get a small beer and a portion of tapas. If you missed it today, there is another chance tomorrow to enjoy some traditional fare. New for this year, they've set up a small arena where young men can test their skills against small bulls. It looked more dangerous than it was because the bulls horns were all taped to prevent them doing any serious damage. and of course the bulls were unharmed - they just got a bit of good exercise. I have tried to send a comment, but I`m not sure if it has been done succesfully. Therefore I send you an e-mail to make sure that you receive my impressions of your web. First of all I want to congratulate you for the great web that you have regarding my beloved town, Bigastro. I´m a bigastrense, currently living for job, in Playa del Carmen, Mexico. I like to be informed about what happens in Bigastro and chat with family, friends, etc. I was quite surprised when I saw the very fresh photos of the last weekend; you updated information even before the official web of Bigastro, which is perfect. I love so much my town and I miss everything there. I used to participate in the San Joaquín party with the “Ya Estamos Aquí” group. I feel very proud of been bigastrense and I speak when I have the opportunity, doesn´t matter where I am, about my town. I know many foreign people from many countries and every one who knows me, knows that before Spanish, I´m from Bigastro. You are doing with your web site a very big job to let the people know our pretty town. I hope to watch more pictures of the current San Joaquín local party. Also I hope you enjoy every day. I think the next time I visit Bigastro it will be by Christmas time, I hope to meet you there and to have a nice cup of tea. Well Ramón, I think you have already gathered that we are thoroughly enjoying the Fiesta this year. We'd be delighted to have a nice cup of tea with you. You'll find we serve Tetley's tea here at Casa El Willo. Whilst we are generally converts to Spanish food and drink we still need a good cup of English tea each morning to start the day. Whilst we bake in glorious sunshine, parts of Britain are on flood alert. Some areas had more than half the average monthly rainfall in just two hours yesterday. The Met Office said that in Norfolk 36mm of rain fell in 120 minutes and some southern coastal areas faced gusts of up to 60mph. London and Cardiff are also edging closer to their monthly average and seven rivers were put on flood alert. The capital has already had 32.8mm of rainfall in the last 12 days — just under 10mm short of the monthly average of 42.6mm. For Orihuela, the forecast is for the sunshine to continue until at least next Monday with temperatures hovering around the low 30s. People asked us why did we want to live here! When Tony Blair tried to introduce a "cafe society" to Britain and extended licensing hours to 24 hours per day, he might well have had Bigastro in mind. Last night we went down to see the barracas that the camparsas have set up in the park. Each camparsa or group has its own barraca or area which they fence off and decorate. In the centre of the park is the disco and main bar. We were particularly keen to visit the barracas of "los que no perdonan" and "¡¿pero yo por que?!". Susana and Consuelo had invited us to go for a drink at the first and Raquel, the daughter of our hairdresser had invited us to the second. Susana tells me that the name, "los que no perdonan" is the Spanish title of the movie "The Unforgiven" by John Huston starring Burt Lancaster and Audrey Hepburn ; "pero yo por que" literally means "but I for what". Apart from the activity in the park, all the bars in the town were in full swing serving food and drink outside until the early hours of the morning. We met some of our Spanish neighbours and friends who, like us, were out to paseo. The town had a fabulous party atmosphere about it just like Tony had envisaged for towns like Barnsley in England! Their theme is boxing. The guy on the right looks set to beat his opponent. Snow in Spain at this time of year! Forty degrees C is punishing enough for we humans. Just imagine being a Siberian bear in this weather. The zoo in Elche has a novel solution to the problem. They freeze large blocks of ice that contain the bear's favourite treat - strawberries. The bears lick away at the ice ,which can last up to six hours, to get to the fruit. The keepers also spray the bears with cold water to cool them down. The tropical birds and animals are of course delighted. They relish the hot weather. I welcome comments to my posts. Your thoughts help me to keep a focus on my writing. Most of the comments I receive are very complementary with just the odd criticism thrown in now and again. I don't mind criticism. Many of my posts reflect my own views on life here in Spain which you may not agree with. However, the information I use is carefully researched from articles in Spanish and English newspapers and periodicals. This blog was originally set to allow anonymous comments to be posted without moderation. That allowed people to write what they wanted without identifying themselves. I've now changed that. Your comments will still be posted without moderation but only by those of you with a Google account. Getting an account is simple and free and so poses no problem for you. By taking this step at least I will now who you are. The Confederación Hidrográfica del Segura(CHS) has given approval to provide 3,500 litres of water per second from the marsh of La Pedrera to irrigate the Vega Baja del Segura. This supply of water will be carried out over a period of 21 days and has been made possible by the savings in the Vegas Media and Alta. The fresh water will improve the quality of that which is been drawn from the emergency drought wells by agriculturalists. The water in the wells is high in salt which harms the crops. Only plants like tomatoes can tolerant salt water which is why they are grown widely in the Canary Islands. Not content with holding a Fiesta, Bigastro is also participating in the Valencian Network of Rural Development (Fevader) road show this month. The show is touring the coast promoting the municipalities which are inland from it. Last night it was the horses and their riders that showed off. Have you ever seen a horse with a more beautiful mane than this? As usual you will find more pictures in my gallery by clicking on the link at the left. Shopping - good for you?